The What: Draper's Screen Boom is ideal for spaces looking to get a motorized projection screen into the space without being too intrusive. The What Else: The Screen Boom is mounted on a motorized operable arm. The whole system is stored, with the screen retracted, nearly flat against a wall. 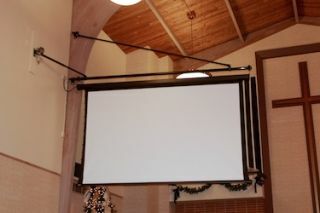 Operate the Screen Boom to swing the screen out into the room, any distance up to 90 degrees, then lower the screen for use.